Is writing a painful struggle? An excruciating battle to get your ideas on paper? If you’d asked me a few years ago what I love doing, I would have said cycling, swimming, or cooking. Eating a good meal, enjoying a glass of wine and a good conversation. Writing was a painful struggle. Blank sheets taunted me. My inner critic nagged. I was fearful of publishing my content. The only thing I liked about writing was the sense of achievement after having finished a piece. But over time, I’ve learned to trust my writing process, and I learned to find my flow. When we’re in a flow, we forget temporarily who we are. We lose our sense of time. We’re at ease in our skin. When we’re in a flow, our inner voice forgets to nag, we don’t hear what’s happening around us, and we don’t worry about what people might think. We’re fully present, and feel in control. We’re intensely focused on the task at hand. When we’re in a flow, we feel happy. So how can we get in the zone and make writing a joy? The challenge with writing is staying in the present. When we think about how much traffic our content will generate, we’re not in the present. When worrying about social shares or comments, we’re distracted. When we wonder whether our efforts will pay off or feel anxious a piece of writing might not be good enough, we’re not in the present either. All these distractions spoil the fun of writing. So, the first trick for finding your flow is to forget about the impact your writing may have, and focus on the act of writing only. Write because you want to write. When experience is intrinsically rewarding life is justified in the present, instead of being held hostage to a hypothetical future gain. When I focus on writing, I find pleasure in small writing achievements. I find a word I like. I compose a sentence to formulate my thoughts. I create a paragraph that didn’t exist before. This is how writing becomes a journey of discovery, every time. Writing on automatic pilot is no fun; it’s like tightening 1000 bolts while working on a conveyor belt. Finding your flow requires a feeling of personal growth, a sense of discovery and mastery. You can imagine a violinist practicing a specific sequence of notes to master finger placements. You can see how a tennis player practices tossing the ball for the perfect serve. But how can you pick the right challenge for writing? Write something you feel you can write, but that’s not so easy you get bored. When you feel overwhelmed by writing, focus on communicating your thoughts in a clear way. Write content to answer one simple question, such as how to achieve X (when writing a blog post) or why hire me (when writing sales copy). Occasionally, I take shortcuts and write a piece because I feel I have to write it. This doesn’t produce a flow state, but it gets the job done. Most of the time, I’m lucky to write because writing helps me learn. I wrestle with a topic I haven’t quite understood yet; I experiment with a slightly different format; I try to make previous work even better or an existing explanation even clearer. 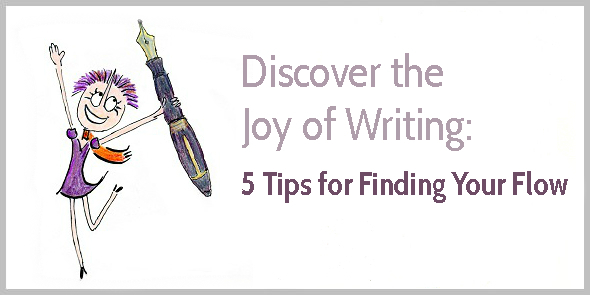 To create a sense of mastery and enjoy your writing, learn how to evaluate your own writing. What do you want to improve? How can you get better? When a violinist practices a sequence of notes, she can hear when the notes sound right, and over time she fine-tunes how she evaluates her play, becoming more demanding. Evaluating your own writing may feel difficult at first. You might know you’re not achieving the same standard as a writer you admire. But what exactly is the difference? When you learn how to write, you improve your ability to evaluate your own work, too. You start reading differently, picking up subtle differences in writing voice. You fine-tune your sense of sound and rhythm, and get to appreciate the precise meaning of words. Learning to write is like learning to appreciate a good wine. A flow state requires an intense focus. Most standard advice suggests to block out distractions by closing the door, putting your phone on flight mode, and switching off any desktop notifications. The biggest distractions aren’t external but internal. Your inner critic berates you for making mistakes. That voice tells you you’re too slow. You can train your muscles to become stronger, and you can train your mind to improve your ability to focus, too. For instance, use a timer and challenge yourself to write for 10 minutes; slowly increase your target to 25 minutes. You can also train your mind with non-writing tasks, like reading a difficult text or practicing mindfulness. Be kind to yourself, and accept that concentrating on one task requires practice. Small children can play, dance, and draw without worrying what others think. This is how they learn. As grown-ups, we worry about people criticizing us. We feel the need to be productive. To enjoy your writing, embrace your inner child. Give yourself permission to be a beginner. Stumble around and get up again. Thanks for this article. I am currently writing all the content of my future London Guide and this is very helpful. Focusing on the joy, purpose and meaning of what we write is essential to deliver a great product/result. After just having spent some time in London, Virginia I would be most curious about your London guide (when it’s ready) for my next visit. Please post a link to sign up for the announcement. What is fascinating to me is being able to take this concept and move it into other areas of our life. My background is in sport, so I’m quite comfortable “stumbling around” when I start a new athletic endeavour, because although I can’t see the end, I trust the process. I have to remind myself that when I am in a different environment that I am less comfortable in (non-sport), the process of stumbling at first remains the same, and will work out in the same way. But I can take courage from knowing that stumbling IS the process. I love Mihaly’s work. Great post! Interestingly, I didn’t really like Csikszentmihalyi’s book. I love the concept of flow, and I liked how he explained what flow means and how you can achieve it in many different endeavors (from being an amateur historian to a rock climber), but the book felt a little over-ambitious as if he wanted to solve all the world’s problems by getting everyone in a flow. His tone came across as a tad arrogant at times, making me feel inferior because I don’t feel the need to undertake all these flow activities all the time. Maybe I’m too sensitive? I doubt that you are too sensitive…but I would guess far more receptive than I am. ? As I’ve only become more aware of voice in the past year, I’m sure I was completely oblivious to the tone when I originally read it. ? First and foremost, I would like to thank you very much for your regular emails, needless to say that they are inspiring and indeed learning a lot from them. Greatly appreciated and please keep them coming! That been said, to answer to your question regarding writing being a struggle, I agree and it is for me. It is a struggle for me because I am always not sure if I am using the proper words and I am also having a problem to be concise. I often feel that I am making many mistakes and not being able to get my point across. Hi Yasmine, thank you for your lovely compliment! In my experience, the biggest improvement in writing can usually be gained by focusing on getting your point across. Before you start writing, think about your key message and the key points you want to get across. Try writing these down in a few bullet points. Once you’ve written a first draft, leave it to rest for a couple of days. Then compare your outline with the text. Have you followed the outline? Are all the points clear? Are any paragraphs redundant? If you’re worried about grammar or spelling mistakes, ask a friend or proofreader to check your text. That’s the quickest way to learn. It’s okay to make mistakes, and once we know which mistakes we make, we can keep an eye out for them next time. On choosing words, if you’d like to improve your vocabulary, then pay attention to the words that writers you admire use. If you like them, add them to a list. If you don’t know them, look up their meaning. This is how I improved my English. I also use the thesaurus a lot. I just LOVE this article, Henneke. I can relate to everything you say. Still being a beginner in a world of blogging, I feel exactly what you describe – in the middle of a struggle. Unable to gather my thoughts and think logically; allowing distractions to conquer my mind. When I find this flow, I feel a tremendous pleasure and a fresh whiff of creativity. “Most of the time, I’m lucky to write because writing helps me learn.” – Yes yes and yes! Just yesterday I wrote something similar in my draft for the new about page. Thank you for the reminder that learning can be fun if we don’t forget to open ourselves to the world, see it with our inner child’ eyes and PLAY! Thanks for sharing another example of your valuable experience. PS Your illustration makes me giggle! As you’ve discovered flow, can you figure out how to re-create that same feeling and block distractions? Blogging IS overwhelming because there’s so much to think about. I really have to take it one step at a time. I’m sure she does ?, and I plan to take DaVinci course next year. ? Henneke, you know I think writers’ block comes from being bored with one’s own voice. So I see this email from you, about how to stop being bored, essentially, and it is the answer my student needs. Perfect! I shall share it with her and help her develop these skills. I cannot wait! Yay! I like it when an article arrives at just the right time. Thank you for sharing it with your student, Katharine. I hadn’t thought about writer’s block as being bored with one’s own voice, but it might be true. When this happens, setting a fresh challenge (not too hard, not too easy), might help to get unstuck? Actually, I thought much of what you addressed, above, was pretty close to writer’s block, which is why it gave me the idea. I’d not thought of ‘writing in the present moment’ before. Like you said, it’s far easier to focus on the possible outcome (traffic/shares, etc.) rather than the act of writing. I like those challenges you highlighted. I use those too when I want to improve my writing. Happy writing, David! Thank you for stopping by. Right out of a how to manual on being a writer. Writing is hard. So is playing a violin, being a doctor, flying an airplane. Life is full of hard. Great advice. Thank you a million times. And woo, woo to you too. I’ve been chuckling all morning. Yes, writing is hard. Thinking is hard, too. And we often need to think hard before we can write with clarity. You have hit it as usual and I was nodding all the way! “Write because you want to write” has been my biggest motivator to find my flow. When I started out, I didn’t know what flow is – to be honest, at that time writing was really a pain and I hated it so much. I was always finding ways to escape the situation. But that is not good for my business. Once I started to find out my “want” for writing the flow happened. And more importantly, “focus” helps me to keep the flow intact. I have exactly the same experience, Jane! Writing probably also becomes easier when we start getting a sense of mastery, when we feel we’re on the right track. It makes it easier to trust the process and get on with writing rather than worrying all the time. I go through times when I love writing, and times when it is a chore. I’ve noticed that the ‘chore’ times tend to coincide with when I’m not sure what to write about, and when I am under deadline pressure. The deadline solution is simple, but ‘what to write about’ not so much! Also, I love what you say about writing for yourself … to learn… but finding the right topic that will help me learn & also be of interest to my subscribers often has me tearing my hair out! Thanks for the reminder in #1 about finding intrinsic pleasure in writing. This is something I say to my cartooning students often: focus on the process & let go of the outcome. Thanks & have a great week ? Have you tried writing about the topics you’d like to write about? You might be surprised – your subscribers might like it more than you think! So many similarities exist between writing and drawing. Learning to draw has definitely helped me with learning to write, too. Writing in the flow takes me out of myself. That’s what I love about it. There are times I look up and three hours have gone by. I didn’t feel it. Its a strange, almost refreshing feeling. That sounds like a great flow experience! I have a strict “diet” of max 30 minutes at my computer so I can keep my muscles relaxed. But even with shorter sprints of writing, it’s still possible to get into a flow. Good to see you again, Laurie! You have certainly hit the nail on the head with this post, Henneke. Writing can be difficult at times, Much easier when you don’t have a self-serving agenda. Using a timer forces you to get on with it. It is one of the best tools for a writer. Yes, a timer is such a simple productivity tool, but really effective! Thank you for stopping by, Ray. Hi, Henneke. Thanks for a great post! I can relate to everything in it as I struggle with finding my voice and getting in the flow. Of course, it’s easier when I’m not distracted and it helps to be organized — something that’s a challenge as well. I’ve dabbled in writing for a long time, but now desire to take it to the next level of purpose. Looking forward to putting these tips into practice. Thanks again for your tremendously valuable site. Your posts are always on time and on point! Don’t worry too much about finding your voice. When you write meaningful content for your audience and focus on writing well, you’ll find your voice over time. Thank you for your lovely comment. Calmness and flow seem to be in short supply these days – not just with a young audience. I’m going to have a look at the videos later. Thank you for sharing, and please keep warm in snowy Geneva! this is wonderful article, i love the way you are expressing and laying out the fact that actually myself will never notice or i keep complaining on external sources. i can’t agree more that everything depends on our inner mind and need, thank you very much for the articles and hope to read more to release and reassess the true inner goal . I’ve started to learn that I might not be able to control external events, but I can control how I react to them and how I let my mood be impacted. It’s quite liberating and calming. Thank you for your comment, Jenny. I appreciate it! I’m joining the conversation a bit late but, I have to tell you I’m still thinking hard about your last two lessons: making the complex, simple; and, ending gobbledygook. Henneke, I never thought I was a gobbledygook writer for one thing…but oh drats, maybe I am! Yikes. Also you mentioned solving topic complexity in writing by narrowing what you cover to a particular point and not always making a blog post, for example, a long or “epic” piece of work. Oddly, this time, I just happened to write about 3 short form pieces because I was thinking maybe (against a lot of what I’ve been taught and told) every post doesn’t have to be a deep-dive, long form work. Hmmm. Maybe I want to 1.) mix it up with my content and 2.) respect readers time (offering value in a quicker read.) Guess what, although I don’t write for social shares in general (though try for them when I write for others as a metric) I had a bunch of unexpected social shares on LinkedIn and since this was on my own site (no share request ever made for there! Lol) I honestly think it had to do with article length and maybe a nice comment on LinkedIn helped too. But it was unexpected and made me feel like I want to practice some more shorter content work and experiment. I also notice a few places I like to read for business and marketing updates keep their word counts to much shorter content pieces than I’ve had drilled into my head as proper quality content. Geez. Some of these are places I’d like to write for and I’m not writing anything that’s not fairly complex, and longer. Then, while all this is still sinking in and in testing and production, you come out with this! Lesson 3 and the final truth—WRITING IS FUN TO ME! I think when I find it fun, my work turns out better. I love to write. I can get lost writing all day and night. When I’m in the flow or following an idea, there’s (like you say) focus, but it’s fun and doesn’t feel like work. It’s stretching in new ways like you say here, all the time. It’s having different projects and different work and researching and taking time to create the very best you can that you hope will be read. Be useful. Be interesting. Be enjoyed. Be noticed. Henneke…sorry if I’m getting carried away but, these 3 lessons are a perfect summation to reach a level where I think your “creativity within structure” theory combusts and I’m expecting, at any time, to create “word lightning” using this as a model. What do you think? You’ve never struck me as someone who uses a lot of gobbledygook, so I wouldn’t worry about it! I saw in Andy Crestodina’s research, that bloggers who write longer content tend to report better results. But I don’t think there’s a one rule that fits all and length and frequency of publishing are related, too. When publishing more often (weekly or more than once a week), many readers would prefer shorter content (but again, that might not be true for everyone). It’s great to hear you had success with creating shorter pieces! Keep having fun! So true! Great Article Henneke. To enjoy writing, it’s important to wake up that inner child. Children play and enjoy the life, you can too do that while writing. Focus is what you need. I totally with your point. The biggest distractions are not external, they are internal. I have always tried to be myself while writing. And it gives me a feeling of joy. Great to hear that writing is giving you so much joy, Ravi. Happy writing! I am landing here for the first time! And to this gem you wrote. I am not good at writing. Not that I do not want to write but some things are the obstacles. First and foremost is not being an English speaker. Secondly, being caught up with so much. But, I am trying hard to get improved day by day to get back on the track with managing my own blog. What I need is the Focus and Nurturing the sense of play. Thanks for writing this up for us! Welcome, Adeel, and thank you for stopping by to leave a comment. I’m glad to hear you enjoy writing. I’m not a native English speaker either! Thanks for this well written piece. With so many “tricks” to make your content go viral, I think we forget sometimes to focus on the basic thing — writing itself. Thank you for this .. I’m going to adjust my methods. I really found my attitude to writing changed a lot when I stopped worrying about traffic, shares and comments. It’s become so much more enjoyable. We can’t control the outcome of our writing, but we can do our best to make each piece of writing good, and it’s liberating to focus on just that: writing. Catching up on emails here, it is so horribly hot outside, even in the mountains. Great article, I have shared it with the writing group I go to. They like your articles. I enjoy playing with words and editing. Just have to remember that when I sit down to a blank screen – get some words in front of me then play with them. Always enjoy seeing Henrietta. Hi Susan, How nice to see you again here! Thank you for sharing my content with your writing group. I appreciate it. Just WoW! Thanks for writing such a great article about writing. Nowadays, I’m feeling so annoyed whenever I try to write. From last two years, I’m in blogging field, and I’ve written uncountable words and articles. Now, whenever I want to write a new article, then It feels like so irritating. But, After reading this article, I hope, I’ll start a new writing life. I’ll try all of your methods that you mentioned above in the article. To me, the key to keeping up blogging week in week out is to find a topic I feel excited about. I need to feel curious to learn more. Happy blogging, Paramjot. I hope you’ll find your mojo back.